All our custom cake toppers are 100% handmade - not cast into molds or just painted. Our custom cake toppers are sculpted with different color clays to create the best detail you can obtain in your custom cake toppers figurines! Free custom cake topper dolls proofs are given on every doll we create. 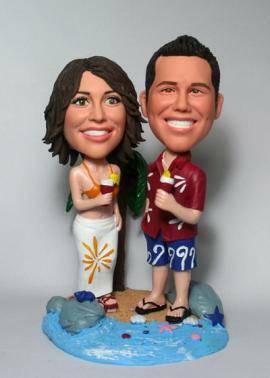 This allows your approval to better assure you that you will love your hand made custom cake toppers. We offer FREE APPROVALS in the different stages during the creation of your hand sculpted custom cake toppers. During the process, we send head proofs, hair proofs, body proofs and final proofs to your email. Each step can be approved or modified, if a change is requested, we will amend the doll and provide a new proof - if it is approved we will bake that step and move towards another proof. As approvals are received, we bake and process your cake toppers, we can not move backwards.